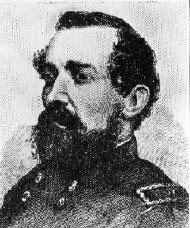 Jesse Lee Reno was a career United States Army officer who served in the Mexican–American War, the Utah War, the western frontier, and as a Union General during the American Civil War. Known as a "soldier's soldier" who fought alongside his men, he was killed while commanding a corps at Fox's Gap during the Battle of South Mountain. Reno County, Kansas, El Reno, Oklahoma, Reno, Nevada, and Fort Reno in Washington, D.C. were named after him.